A parliamentary report of 1777 recorded parish workhouses in operation at Stanes (sic) for up to 50 inmates, Harlington (40 inmates), Harmondsworth (4), Shepperton (35), and Sunbury (25). Staines had a workhouse by 1759, probably near Pound Mill, just east of the former Staines West station. In 1777, it housed up to fifty inmates. The parish also used a property at Hale Bridge. At various times, workhouse inmates were occupied in oakum-picking and sack-weaving and basket-making. 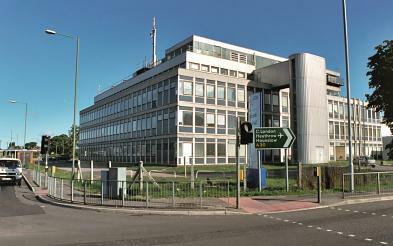 The Pound Mill premises replaced in 1824 by a new building on Shortwood Common. In June 1791, the master of the Staines workhouse, William Seymour, was charged with assaulting a pauper and accelerating his death. In order to rid the parish of responsibility for the man, who was seriously ill, Seymour had violently dragged him from the workhouse and across the parish boundary. He was left on a common, unable to move and exposed to the elements, and had died not long afterwards. Seymour was given a year's imprisonment. Middlesex: Ashford, East Bedfont with Hatton (2), Cranford, Feltham (2), Hanworth, Harlington, Harmondsworth (2), Laleham, Littleton, Staines (4), Stanwell (2), Shepperton, Sunbury (2). The population falling in the Union in 1831 had been 12,644 — ranging from Littleton (134) to Staines itself (2,486). The average poor-rate expenditure for 1833-5 had been £6,903 or 10s.11d. per head of the population. 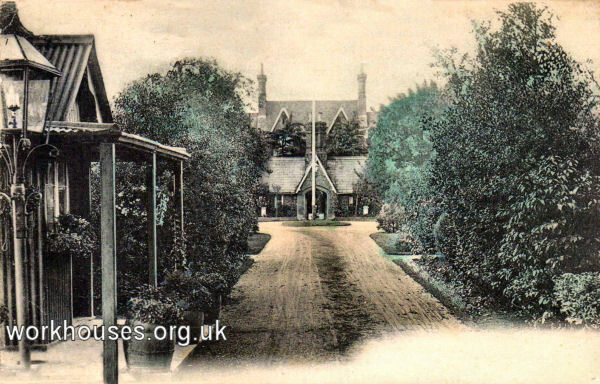 Staines workhouse entrance from the south, c.1905. The former workhouse later became Ashford Hospital. All the original workhouse buildings have now been demolished. Staines former workhouse site from the south, 2001. By the 1920s, the Staines Union was operating three children's scattered homes at Stanwell, exact location undetermined. They could accommodate a total of 93 children. London Metropolitan Archives, 40 Northampton Road, London EC1R OHB. Holdings (filed under 'Ashford Hospital') include: Births (1848-93); Deaths (1890-1954); Creed registers (1869-1930; Admission and discharge registers (1912-40); Register of defectives (1886-1930); Register of lunatics (1919-33).